The Shop, Hop & Top Package allows you to experience the best of Manhattan with our Hop-On Hop-Off sightseeing buses with over 30 stops and connecting transfer points to switch from one tour loop to another. You can also use our Hop-On Hop-Off ferries and experience New York from the water. Your package includes tickets to Top of the Rock Observation Deck or Empire State Building Observatory, a trip to the Woodbury Common Premium Outlets and entrance to the New York Historical Society or Museum of the City of New York. Click HERE to see a map of the loops! Hop on one of the many Hop-On Hop-Off sightseeing buses and enjoy one of the many exciting tours. On the buses you'll have the option to listen to the tour guide in English or an audio guide in English, French, Spanish, German, Italian, Portuguese, Mandarin, Russian, Japanese, Korean or Hebrew. CitySightseeing New York Hop-On Hop-Off Ferry allows you to enjoy a fun and flexible sightseeing tour around Manhattan harbour by the sea! Learn about NYC with guided tour commentary while traveling from stop to stop. This package also includes a ticket to Top of the Rock Obeservation Deck or Empire State Building Observatory, where you can enjoy the amazing view of the city. You also get a trip to the Woodbury Common Premium Outlets, where you can shop till you drop! In addition you'll get an entrance ticket for the New York Historical Society, one of America’s pre-eminent cultural institutions, which is dedicated to fostering research, presenting history and art exhibitions. Founded in 1804, the New York Historical is the oldest museum in New York City or the Museum of the city New York, celebrating the city's cultural diversity and evolution. 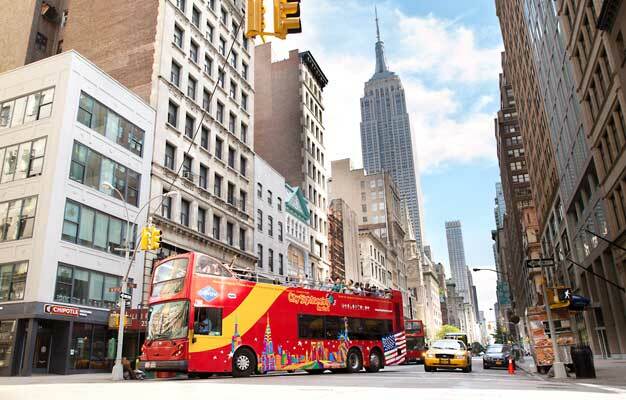 Shortly after your booking is complete your e-ticket will be send directly to your email, just print it out and bring it to Gray Line CitySightseeing New York visitor center located in the lobby of Madame Tussauds, where you'll exchange it for your tickets. Hop-On Hop-Off bus tickets are valid for 96 hours from the time the ticket is issued at the visitors center. Tickets for Top of the Rock or Empire State Building Observatory, Woodbury Common Premium Outlets, the New York Historical Society or the Museum of the City of New York and City Sightseeing Hop-On Hop-Off ferry are valid as indicated on the ticket stub. What can I see with the Hop-On Hop-Off buses? Downtown Tour: Stops include Empire State Building, Greenwich Village, SoHo, Little Italy, Chinatown, World Trade Center site, Battery Park (departure point for Statue of Liberty/Ellis Island ferry), South Street Seaport, Times Square, Rockefeller Plaza, Radio City, United Nations, Fifth Avenue and more. Uptown Treasures & Harlem Tour: Stops include Central Park, Lincoln Center, Theater District, Fifth Avenue, American Museum of Natural History, Cathedral of St. John the Divine, Apollo Theatre and Harlem neighborhoods, Metropolitan Museum of Art, Guggenheim and other famous cultural attractions on Museum Mile and more. Brooklyn Tour: Stops include Brooklyn Promenade/ Cadman Plaza, Atlantic Avenue, Barclays Center, Brooklyn Museum of Art and Botanic Garden, Brooklyn Public Library, Fort Greene Park and Brooklyn Academy of Music. You will also see Old Fulton Landing, Grand Army Plaza, Brooklyn Bridge and Manhattan skyline. Bronx Tour: The Bronx – birthplace of hip-hop, tap dancing and breakdancing; home to the Grand Concourse (1909) modeled on Paris' Champs-Elysees and Yankee Stadium. The tour begins at the Grant’s Tomb. En-route to the Bronx you will view more neighborhoods of Harlem and Upper Manhattan. Your tour guide will provide information about the history, culture and diverse population of the Bronx. At the only hop-off stop you can get off and see baseball’s Yankee Stadium, home to the 27-time World Series Champions, the New York Yankees. Night Tour: See New York when it sparkles! Enjoy the night time views and ambiance of Midtown Manhattan. Also marvel at the memorable views of Chinatown, Empire State Building, SoHo, Little Italy, Manhattan Bridge, Brooklyn Bridge and more! (Not Hop-On Hop-Off). Yes, for children between 3 and 11 years old. Children under age 3, accompanied by an adult and not occupying a seat, travel complimentary.